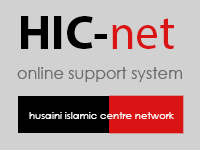 HIC Peterborough have pleasure in launching HIC-NET an online platform enabling members to submit and track specific communication directing to any committee within the Jamaat. Currently any feedback, enquiries or complaints are dealt with verbally. This is an inadequate system which results in delayed and sometimes forgotten communication. HIC-NET allows users to make a submission online. The submission will be logged and can be directed to the relevant sub-committee. Members can track responses to their submission at any time by accessing through their user interface. We pray that the system is useful and look forward to your communication.